If old architecture, a killer art scene, amazing events and local diversity is your thing, DTLA is calling you. Downtown Los Angeles has always been a place of contemporary cuisine, various cultures and one-of-a-kind entertainment. But this neighborhood was usually known as a place to visit and not to reside. Now downtown is quickly becoming LA’s up-and-coming neighborhood to live in! So get over to DTLA and use this ultimate guide to Downtown Los Angeles and check these off your bucket list before the traffic gets worse (if that’s even possible). The Standard Rooftop Bar – You probably have heard of the Standard Hotel chain from across the nation. But the best part about this particular hotel location is its awesome rooftop bar. Tourists, professionals and young boozers come here to partake in the amazing views along with the chill pool scene. And of course the libations. Church & State Bistro – Hidden in a beautiful brick building, west of the Los Angeles River is this underrated, no frills French restaurant. The rustic-chic restaurant creates homemade charcuterie and puff pastry escargot that will make miss France a little less. Bestia – Located in the Arts District is some of the best Italian cuisine in town! Treat yourself to a saffron lobster crostino and maple ricotta fritters while enjoying the stunning aesthetic that resembles a gastown, brick and mortar vibe. Bottega Louie – This is the place for you Francophiles with an insatiable sweet tooth. The renovated and famous Brockman Building turned french patisserie/restaurant has delicious fare that resembles New York’s dining scene. But the real treat is the desert counter filled with colorful macarons and chocolate, raspberry stuffed beignets! Urth Caffe – My favorite cafe of all time is in Downtown (too bad it’s a pain to get there). Urth Caffes can be found throughout Los Angeles, but only one is located inside a beautiful building with a large clock tower in the heart of the Arts District. Plus, I’m convinced the Japanese Green Latte is better at this location compared to its sister spots. 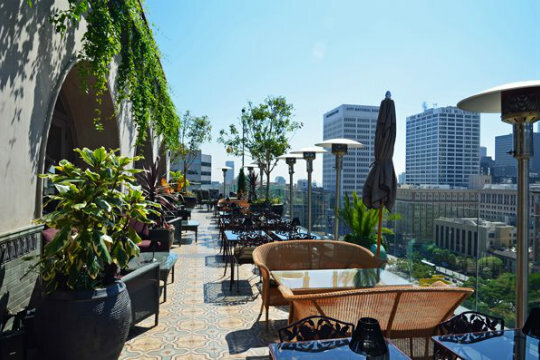 Ace Hotel and Rooftop Bar – The latest and trendiest bar scene also happens to be atop a rad hotel. This luxury boutique hotel hosts a bar scene known as Upstairs, where you can sip city transportation-inspired cocktails while enjoying local events. Plus, you can crash at this swanky accommodation instead of Ubering. Grand Central Market – You haven’t done DTLA right if you haven’t checked out the Grand Central Market. This market is unlike a typical farmer’s market found in Los Angeles. This market not only has fresh produce but some fancy and gourmet restaurants. Some popular dining options include Eggslut, McConnell’s Fine Ice Cream and the Oyster Gourmet. Perch – Part French, part architectural masterpiece, part epic view, this restaurant has everything a trendy Angeleno could want. Most come to dine on the French food around sunset to see the skyscrapers against the orange sky. Then again, their brunch on Saturdays and Sundays is pretty amazing, too! Chinatown – You know you’ve seen Chinatown if you’ve ever seen the movies Pretty in Pink, Beverly Hills Ninja or Rush Hour. Chinatown has amazing restaurants and authentic Chinese shopping along with its impressive production scene list. Museum of Contemporary Art, Los Angeles (MOCA) – The MOCA might just be LA’s most underrated art museum. The MOCA has 3 different locations, 2 of which are in DTLA. And the exhibits here are completely mind-blowing, offering extremely thought-provoking and beautiful installments. Little Tokyo – Did you know Little Tokyo is the largest Japanese-American population in North America? Learn about the history of Little Tokyo, try some traditional Japanese food or enjoy one of the many festivals. The Broad – The newest art museum on the scene also happens to be one of the most interesting. Think of it as a little LACMA on steroids! Here you’ll see art installations from famous artists like Cindy Sherman, Roy Lichtenstein and Jeff Koons. But the biggest must-see is the ever popular Infinity Mirrored Room by Yayoi Kusama. Float in space as you stand by yourself in a sea of twinkle lights by yourself for 45 seconds! The Grammy Museum – Finally, you can walk into a room and feel like the music celeb you always knew you were. Located within L.A. Live is the Grammy Museum, an interactive and educational museum devoted to the various winners of The Grammy Awards. Only in LA, right? Skyspace LA – Do you like heights? Does hurling yourself off a skyscraper sound like a delightful afternoon? 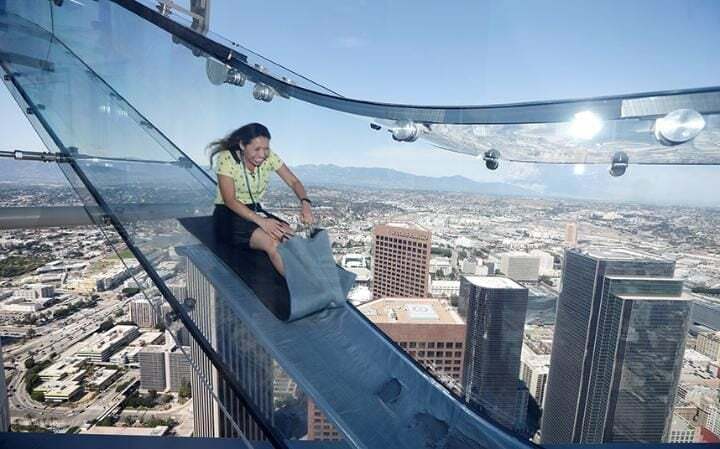 Then you must visit Skyspace LA at the US Bank Tower! An elevator hoists you 1,000 ft high where you can witness downtown from the observation deck and even slide down a glass elevator outside of the building from the 70th floor. EEEEEK. L.A. Live – You’ll always find something going off at L.A. Live. This entertainment hub is home to The Staples Center, The Grammy Museum, The Microsoft Theater, tons of restaurants, and seasonal events. If you’re looking for a casual night out or a huge, seasonal event, L.A. Live will definitely have something for everyone. The Staples Center – The Staples Center is well, the staple of L.A. Live. Here you will find conventions, concerts, and sports events that will make your visit to DTLA so worth it. Just remember to park offsite as it’s usually a mess/expensive! Walt Disney Concert Hall – That giant hunk of metal in the middle of Downtown Los Angeles isn’t just a cool looking sculpture. Home to the LA Philharmonic is the Walt Disney Concert Hall where you can enjoy all sorts of musical entertainment from jazz to classical to theatrical. 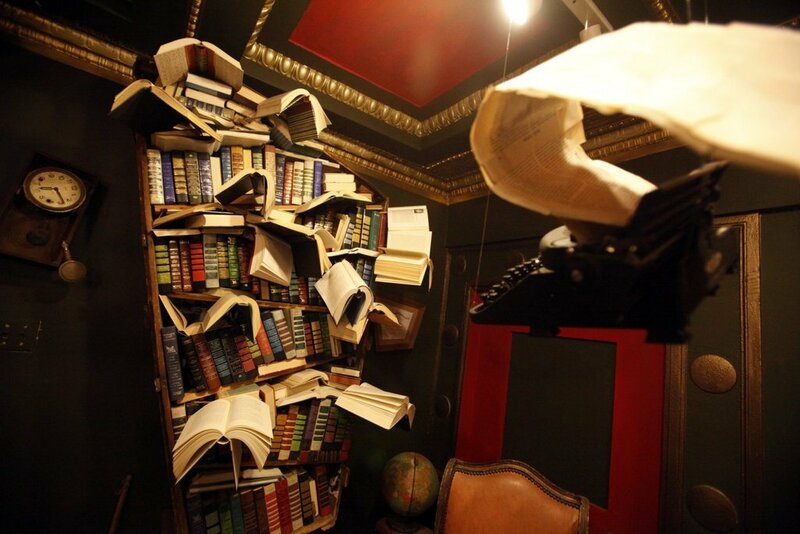 The Last Bookstore – The most interesting bookstore you will ever find is located in the heart of Downtown Los Angeles. Walk into this creepy and musty wonderland to find strange sci-fi novels or hand-me-down classics as well as some interesting book page inspired art. Samples Sales – This is where all of LA’s “it” girls can be found shopping! Famous brands like Wildfox Couture, Sole Society, and more throw sample sales around Spring and Fall time. Make sure to follow third-party websites or your fave designer’s Instagram to know the exact time and location. LA Fashion District – Speaking of the Fashion District, there’s actually more shopping here than you know what to do. Check out the Santee Alley, 9th and Los Angeles Street, the Gerry Building and Cooper Design Space for some awesome designer shopping. Olvera Street – Check out the famous Olvera Street for a more authentic, Mexican culture. This part of town contains 27 historic buildings and a traditional Mexican style plaza area. Here you’ll find handcrafted Mexican wares typical of old Mexico so you can avoid that trip to TJ. BlacklistLA – This trendy and healthy event will have you chasing after that runner’s high. Blacklist LA is a group of runners that set course through the streets of downtown. They host events often, one of them featuring art stops where you can admire recently painted graffiti art. Golden Dragon Parade and Chinese New Year Festival – This 117 year-old event is one of Downtown’s most exciting and culturally rich experiences! The Chinatown Central Plaza celebration brings multi-stage acts like kung fu demos and traditional music performances. The parade usually starts off at Hill and Ord Streets and concludes at Broadway and Cesar Chavez. Downtown Film Festival L.A. – One of the great things about LA is the cinematic masterpieces that come from here. And what better way to celebrate such beautiful art than the DTLA Film Festival? The festival programming highlights “downtown L.A.’s vibrant new urbanism, the unique ethnic and cultural diversity of its neighborhoods, its burgeoning independent film community, its singular blend of late 19th and 20th century architecture, and the seminal role it played in the early days of American cinema.” So basically, you have to attend! Cinco De Mayo Fiesta – Prepare to get your mariachi and tequila on at the biggest Cinco De Mayo Fiesta in the world! The fiesta celebrates Mexico’s 1862 victory over French troops in the town of Puebla. Enjoy the vibes with dancing, shopping and some of the best Mexican food in SoCal all on Olvera Street! Traffic is a Pain – Downtown is in the center of major freeways like the 110, the 10 and the 101. Not to mention, it’s full of working people and one-way streets. This makes getting around downtown very frustrating. If you can, take an Uber. Ride the bus. You can even rent a city bike! Just try to keep away from the traffic and stress. If all else fails, avoid rush hour. Dress the Part – Whenever I’m in DTLA, I can always spot the tourists. Sure, California is casual, but that doesn’t mean you should be wearing your average shirt and flip-flops. Downtown is a completely different scene. If you want to mingle with the entrepreneurs and young professionals, then you need to look sharp, trendy and own it! Keep Your Wits About You – As beautiful as Downtown can be, there’s also a lot of crime. Between the high homeless population, Skid Row and general crazies that reside in every city, you need to be careful. Walk with friends, watch your belongings and protect yourself as you see fit. Curious about the other Los Angeles neighborhoods? Read our guide to Santa Monica and our super useful post that describes all of the major LA neighborhoods!